For all introductory physical geology courses. The Twelfth Edition, Pearson Science’s first augmented reality, hybrid textbook, uses the BouncePages image recognition app (FREE on both iOS and Android stores) to connect students’ digital devices to the print textbook, enhancing their reading and learning experience. Tarbuck/Lutgens’s innovative SmartFigures feature has been expanded, adding new digital content via Project Condor, Mobile Field Trips by Michael Collier, Animated Figures, and additional tutorial videos from Callan Bentley.This edition also includes MasteringGeology, the most complete, easy-to-use, engaging tutorial and assessment tool available. This package includes MasteringGeology, an online homework, tutorial, and assessment program designed to work with this text to engage students and improve results. Interactive, self-paced tutorials provide individualized coaching to help students stay on track. With a wide range of activities available, students can actively learn, understand, and retain even the most difficult concepts. NEW! 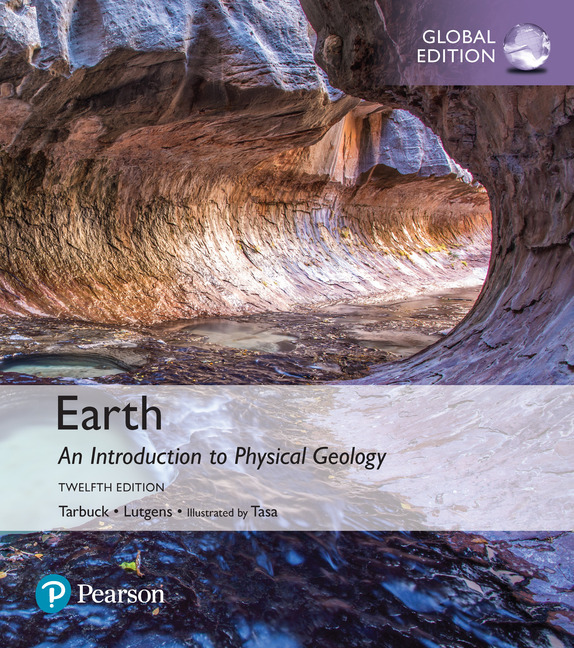 Using augmented reality, Pearson’s BouncePages app launches engaging, interactive video and animations that bring the pages of Earth: An Introduction to Physical Geology to life. GEOgraphics are contemporary, compelling visual representations that present complex information at a glance, simplifying students’ ability to synthesize and recall information. Eye on the Earth feature engages students with active learning tasks, asking them to perform critical thinking and visual analysis tasks to analyze data and make predictions. Strong Readability is achieved through the book's straightforward language, written to be understood. Clear, readable discussions with a minimum of technical language are the rule. Focus on Basic Principles fosters student understanding of basic principles while also addressing topical issues. Flexibility is achieved through the text's adaptable organization, meeting the needs and desires of the instructor. Realizing the broad diversity of introductory courses in both content and approach, each chapter has been designed to be as self-contained as possible so that material may be taught in a different sequence according to the preference of the instructor. This package includes MasteringGeology™, an online homework, tutorial, and assessment program designed to work with this text to engage students and improve results. Interactive, self-paced tutorials provide individualized coaching to help students stay on track. With a wide range of activities available, students can actively learn, understand, and retain even the most difficult concepts. NEW! 24 Mobile Field Trips take students to iconic geologic locations as they accompany geologist–pilot–photographer–author Michael Collier in the air and on the ground to see and learn about iconic locations that relate to concepts in the chapter. In Mastering, these videos are accompanied by auto-gradable assessments that track what students have learned. NEW! Project Condor Videos capture stunning footage of the Mountain West region with a quadcopter and a GoPro camera. A series of videos have been created with annotation, sketching, and narrations to improve the way students learn about monoclines, streams, terraces, and so much more. In Mastering, these videos are accompanied by assessment to test what students take away. SmartFigure Tutorial Videos are accessed using a mobile device with BouncePages, an augmented reality app, and show the student a 3- to 4-minute feature (mini-lesson) that is prepared and narrated by Professor Callan Bentley. Each lesson examines and explains the concepts illustrated by the figure. With over 100 of these SmartFigures inside the text, students have a multitude of ways to enjoy art that teaches. Instructors can assign SmartFigure Activities or students can access them from the Study Area in MasteringGeology. Pre-Lecture Reading Quizzes ensure that students complete the assigned reading before class and stay on track with reading assignments. Reading Quizzes are 100% mobile ready and can be completed by students on mobile devices.